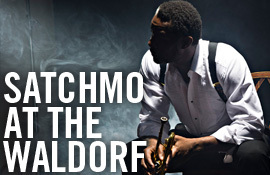 There are two stars in the wonderfully imaginative, one-man play, "Satchmo at the Waldorf." The gifted actor, John Douglas Thompson represents Louis “Satchmo” Armstrong backstage, at his last performance in 1971. Thompson affects a vocal growl and the bowed-leg stance of the sick, aging musician, but also transitions into two very different characters—Joe Glaser, Armstrong’s manager and friend, and Miles Davis, from a different generation of Black entertainers who criticized Armstrong for pandering to White audiences and being an “Uncle Tom.” While never resorting to impressions, Thompson physically and vocally creates a dialog with the audience that allows the trio of characters to explore the soul of a genius, race in America, and the human cost of success. The second star is Terry Teachout’s well-written script, which gives Thompson the opportunity to explore the pain of racial bias, the evolution of jazz, and an era of performance in which the mob controlled business in the night clubs of major cities. Teachout, the Wall Street Journal’s drama critic, has written a biography of Armstrong and knows his subject intimately. In this, his first play, he scores a home-run with an intelligent, honest script, superbly directed by Gordon Edelstein, with a set designed by Lee Savage, and sound designed by John Gromada. Special kudos go to lighting designer Matthew Adelson for punctuating Thompson’s transitions from character to character effortlessly, and collaborating with Thompson to transform him into Miles Davis through light and actor artistry. One-man plays often have a tendency to venerate the subject, but in this production Thompson and Teachout each perform their craft through the story of Armstrong. The audience does not watch, as much as participate in this play, and is given the gift of seeing theatre at its most magical. The standing ovation was well earned, shouts of “bravo” mark this production’s success.